Türkler devoted his life to the organising of the working class and to the fight for a just and humane world. His life was filled with strikes, wildcat strikes, struggles and sacrifices. 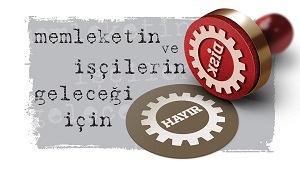 The period from 1960 to 1980 was marked by important milestones in the working class struggle in Turkey. These include the Kavel Strike of 1963, 15-16 June Workers’ Resistance of 1970 and May Day 1977. Kemal Türkler was one of the most prominent figures of this period, during which the working class stood up through massive militant actions.